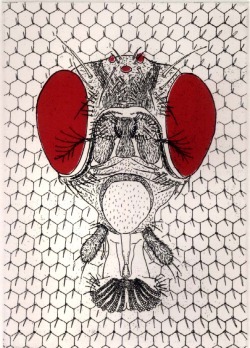 Paper Size: 11" x 15"
Drosophila melanogaster is the genetic model for much of what has been learned about inheritance in this century. Quite tiny at 2-3 mm, the tiny fruit flies can be grown by the hundreds in small vials. With only eleven days needed to complete one generation, numerous crosses can be conducted in a brief period, and an entire programme of genetic dissection can be completed in only a few months. When I was in charge of the teaching labs in genetics at the University of Houston 1984 - 1995, I distributed various mutant strains to student groups and asked them to characterize the mutation through a series of controlled crosses. This term project took most of the 13 weeks of the semester, and required the counting of hundreds of mutant forms. Most students complained about the work load, but eventually gained a great deal of insight into inheritance through the structured experimentation. Some students even grew to love the tiny red-eyed creatures as they exhorted them to reproduce. My graduate advisor, Jim Jacobson, used to introduce his undergraduate genetics lectures with a slide of Drosophila melanogaster. He would point to the giant image of the fly, "Here ladies and gentlemen, is the premier genetic organism, the animal without which genetics would be nothing. Here is the 'King of Beasts.'"